The land parcel is located within a well-established residential area with existing condominiums such as Martin Place Residences, Rivergate and Martin 38. Located just minutes away is the future Great World MRT station. It is also well-served by major arterial roads and the Central Expressway for accessibility to other parts of Singapore. 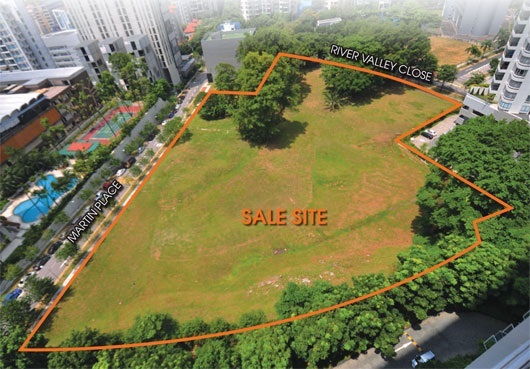 SINGAPORE – Malaysian tycoon Quek Leng Chan’s GuocoLand has won the tender for a prime residential site in the River Valley area, the Urban Redevelopment Authority (URA) announced on Friday (July 1). GuocoLand subsidiary First Bedok Land had put in the highest bid of $595.1 million for the 99-year leasehold private housing site, which is situated at the junction of Martin Place and River Valley Close. The bid price works out to $1,239 per square foot per plot ratio (psf ppr). According to The Straits Times, the price is believed to be a record for a Government Land Sales (GLS) residential plot outside of Sentosa Cove. The bid by GuocoLand was 1.2 per cent higher than the next highest bid of $588 million submitted by a consortium of companies controlled by Mr Quek’s Singaporean cousin, Kwek Leng Beng. In total, the tender for the 171,534.75 square foot site attracted 13 bids, 10 of which were made by local developers. The site has a cap of 450 homes, and part of the site has a 20-storey height restriction while the rest has a 30-storey height limit, The Business Times reported. 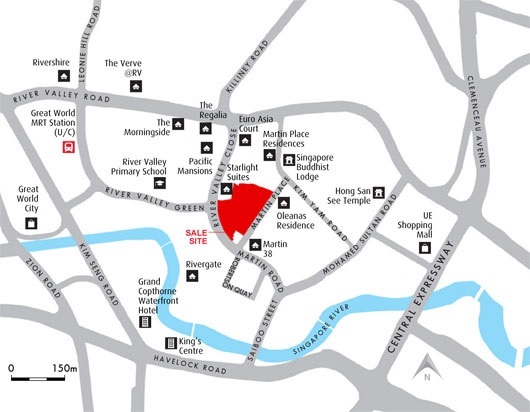 It is located close to Orchard Road and the Singapore River, and is within walking distance of the future Great World MRT station. The $1,239 psf ppr price exceeds the $1,157 psf ppr for a Sophia Hills plot in September 2013, which was the last time a prime-district residential site was sold under the GLS programme. For more information on Martin Place condominium, simply fill up your details below and our salesperson will get in touch with you shortly!